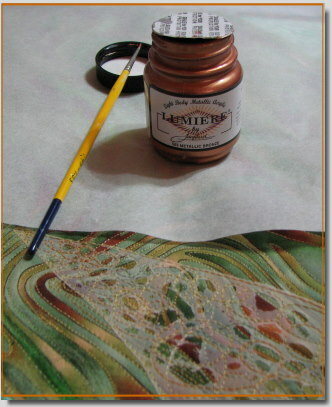 Quilters and fiber artists love their tools. They love buying them, talking about them, and most of all using them. Even those little tools that most of us take for granted can be pretty exciting for someone who didn’t know such a thing was available. Also, we’ve all made purchases that we regretted later. So when a friend or acquaintance recommends something, we feel a little safer parting with our money. I realize that needle threaders don’t conjure up the same interest as the Babylock Embellisher, but they play a very important role in the studio. My favorite two are pictured above, and I don’t know what I’d do without them. The first is manufactured by Clover. You place your hand sewing needle head first into the needle slot provided on the top. Next, you drape your thread through the thread slot. 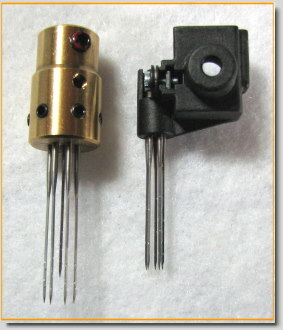 To the right you will see a little spring handle that you push down, resulting in a threaded needle. There’s even a thread cutter to the left of the needle slot. All parts are clearly marked. Occasionally, there’s a needle with too small an eye, but for the most part the Clover does a great job. 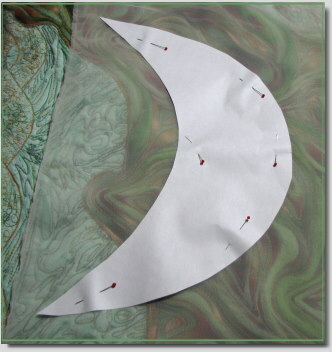 You can find this tool online or at most fabric and quilting stores. An even more versatile little tool is the Universal Needle Threader and Needle Inserter. Manufactured in Australia by Perfect Sew, this needle threader works on hand needles, sewing machine needles, and serger needles. Even though many of us have high tech machinery in our studios, there are times when built in needle threaders do not work owing to the interference of a particular presser foot or to the wire bending and missing the hole. (I have one machine that this happens to frequently.) This tool comes to the rescue every time. Eventually, the little wire on this tool does break, but all is not lost; you still have a needle inserter. I purchase this tool at Nancy’s Notions. Do you know what this is? To be perfectly honest, I had to go by the craft store where I originally purchased it to find out myself. I often shop with an eye as to how something can be used rather than what the manufacturer intended. In this case, the picture above is of a hairpin lace maker. I’ve never made hairpin lace and I doubt I ever will, but I have found a great use for this simple little tool. Notice the holes on the red side pieces. 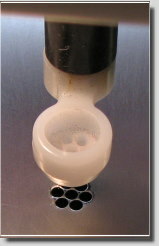 The metal tubes can be adjusted, creating several different widths. When I saw this tool hanging next to the crochet hooks, I knew I had found the perfect trim maker! 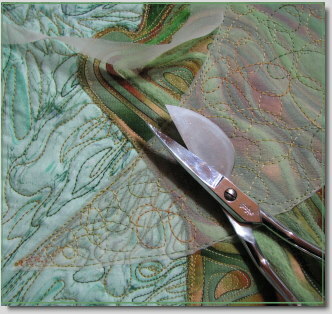 Here is how I make special ribbon trims to coordinate with my designs. First, I decide how wide I want my ribbon and adjust the metal tubes on the hairpin lace frame. Next, I tape the end of the ribbon to one of the metal tubes near the red tube holder but not so close that it will interfere with the presser foot. With ribbon end secure, I now wind the ribbon around the tubes, overlapping each ribbon about 1/4″. When I reach the end, I tape the ribbon tail to the red holder. After checking the ribbon to make sure there are no gaps, I then tape twill tape along the entire length of the wrapped ribbon. Do not cut the twill unless you only need your trim one length of the tubes. Just let it hang over the edge. I set my sewing machine on a straight stitch at 2.5 mm and use a bobbin thread that matches my ribbon. With presser foot raised, I carefully position the ribbon so that the twill tape is centered under the needle. With my left hand, I pull gently pull the ribbon towards me (just a little) so that the needle comes down right before the ribbon starts. It’s a good idea to take a few securing stitches. I then sew all the way to the other end of the ribbon and take a few more securing stitches. I now remove the red tube holder from the end where I began and slip the sewn ribbon off of the tubes. When I have completed wrapping the ribbon, I take the twill tape that is hanging from the previous length and tape it end to end and sew down the middle once again. I do this over and over again until I have the length that I desire. I then locate all the gaps, fold them right sides together, pin, and sew a seam close to the ribbon. After the gaps are taken care of, I dab a little fabric glue on each seam extension (the little loops I just sewed) to flatten the twill tape. I now have a beautiful piece of ribbon trim that perfectly matches my project design! 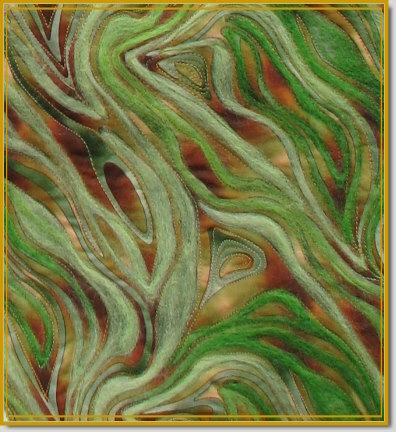 Several companies produce needle felting or embellishing machines and the list is slowly growing. 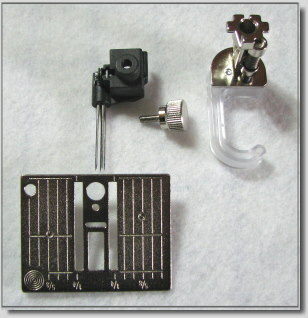 I use the Babylock Embellisher in my studio along with a hand felting needle tool that holds up to six felting needles. The hand tool is useful for detail work as well as preparation work on a piece that will be finished with the Embellisher. When the Babylock first hit the market, my local quilt shop put one on the floor for demonstrations. The samples produced consisted of fabric with a few yarns and ribbons. I must confess, I watched the demonstration and thought, “Why would anyone pay over $1000 to needle couch a few decorative yarns to some fabric?” Well, as it turned out, this machine was capable of doing a whole lot more than that. Months later, I ran into a fiber artist friend of mine who had recently purchased the Embellisher and was producing beautiful art-to-wear and wall hangings using this incredible machine. I stood mesmerized before her work and knew that I had to have one. Within twenty-four hours I visited my local dealership and made an offer on a new machine. At the time, these machines weren’t exactly flying off the shelves so the dealer accepted my offer. The Babylock, a stand-alone machine, uses 7 barbed needles that enter seven small holes in the throat plate. The needles catch fiber from the top layer and pull it down to the bottom layer, eventually creating a meshed double-sided fabric. The Embellisher allows you to use anywhere from one to seven needles at a time. Replacement needles are available through dealerships at about $3 a pop, something to think about during the decision making process. Necessity being the mother of invention, some clever owners have cut hand felting needles to size and used them in the Embellisher quite successfully. You can even order cut needles online at substantial savings. Since its entry into the market, the Babylock Embellisher has dropped in price. If you are interested in this machine, visit a Babylock dealer and don’t be afraid to negotiate the price. Do give some consideration to the importance of warranties and dealerships. Dealers often offer free classes with the purchase of a new machine. Additionally, they offer support when you have a problem (and this is no small thing). The rising interest in needle felting has not gone unnoticed by Babylock’s competitors. 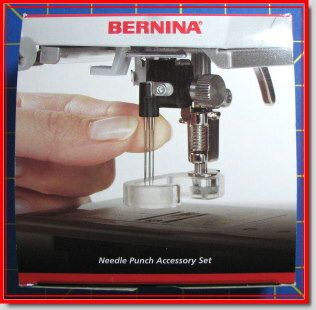 Bernina sells a Decorative Needlepunch Attachment for some of their CB Hook sewing machines. I’m considering purchasing the attachment as a backup to my Embellisher. 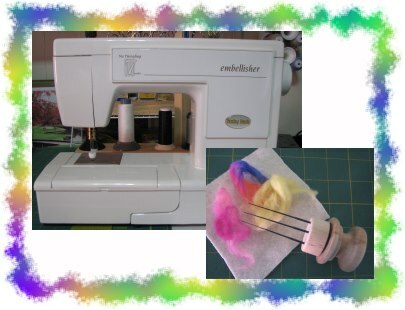 Brother also sells an attachment for some of their machines Janome offers a stand-alone felting machine, and in the latest Nancy’s Notions catalog, Nancy Zieman lists a Sewing With Nancy Fab Felter for $299.00. 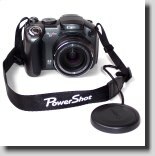 Another company listed below sells a battery operated machine as well as a universal attachment (I have no familiarity with these products). 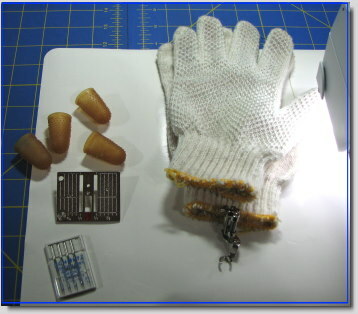 Here is a list of online sites that provide helpful information regarding felting machines and felting attachments. The list is neither complete nor comprehensive. I simply offer it as a starting point for those who have written me requesting information on this subject. A great way to do research before purchasing any machine is to join a yahoo group whose members already own the particular machine in which you are interested. By doing this, you will gather a wealth of information and reduce your frustration level when you actually make the purchase. You’ll also make some new friends who share your interests.